One could never call my Uncle namby pamby. When he puts his heart into something, he’s full-tilt, especially if it’s something charitable. UC purchased a bike and discovered charity bike rides, a perfect outlet for both exercise and his charitable spirit. A bike purchase sounds pretty straightforward, right? It wasn’t for my Uncle. He’s not what you’d call a petite flower. He’s about 6 feet 7 inches tall, produces the best draft on planet earth, and had to order a custom heavy duty frame with custom heavy duty wheels. 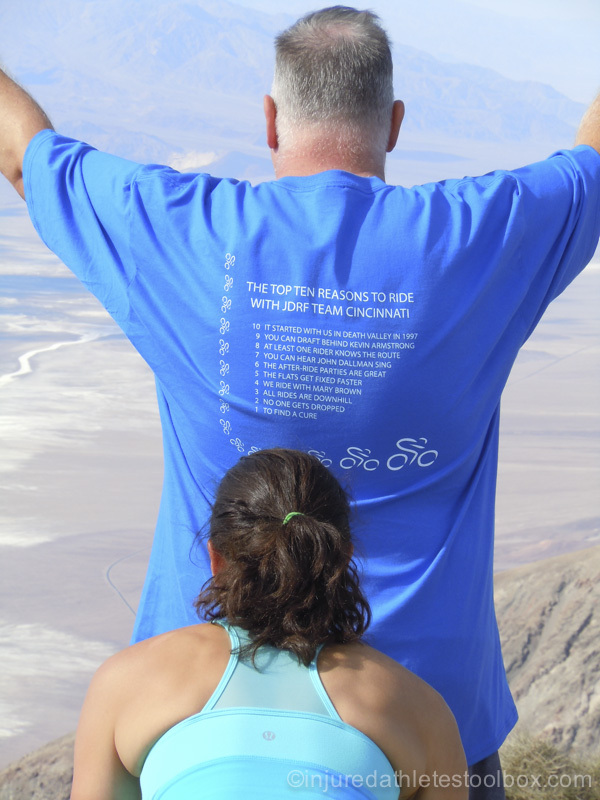 This shirt is entitled “The top ten reasons to ride with JDRF team Cincinnati.” Reason number 9 is “You can draft behind Kevin Armstrong.” In this photo, I’m pretending to draft off my Uncle in the mountains above Death Valley. After some investigation (He’s a CPA, so what would you expect? 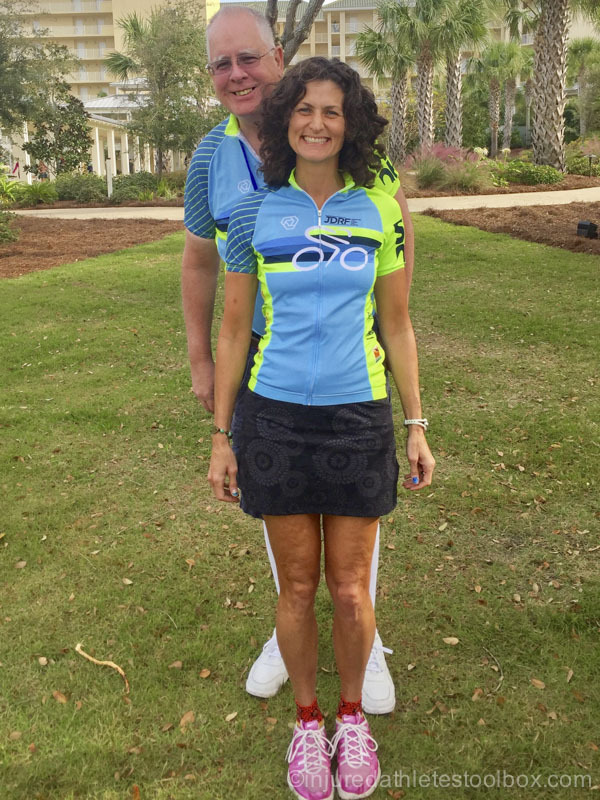 ), he decided to ride his bike to raise money for the Juvenile Diabetes Research Foundation (JDRF). 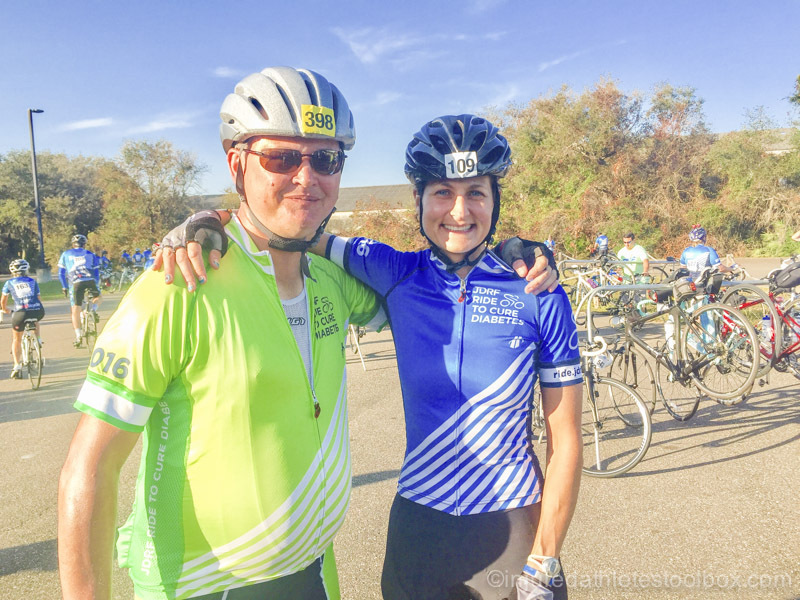 He joined the JDRF Cincinnati Chapter cycling team and trained with supportive, knowledgeable coaches. The team became like family. In 2008 and 2009, UC rode his bike across Death Valley raising tens of thousands of dollars for JDRF. In 2010 I caught the fever, joined the Cincinnati team, raised more than $5000, and rode across Death Valley with UC. Memories of a colorful sunrise over the valley while approaching the line of demarcation beyond which there would not be a sliver of shade for the rest of the day will stick with me forever. UC and me at the top of Jubilee Pass–a long climb out of beautiful Death Valley. This was our first JDRF ride together in 2010. I thought I was packing my bike and flying west to ride across Death Valley. Instead I met a new family in my Cincinnati team and the whole JDRF crew. JDRF supports and orchestrates the Death Valley ride better than any USA Cycling race I’ve attended. They have to. The inhumane heat, low humidity that desiccates you as you ride blissfully unaware, wind that makes riders seek my Uncle’s astonishing draft, and the number of participants with Type 1 diabetes (T1D) beget little room for error support-wise. 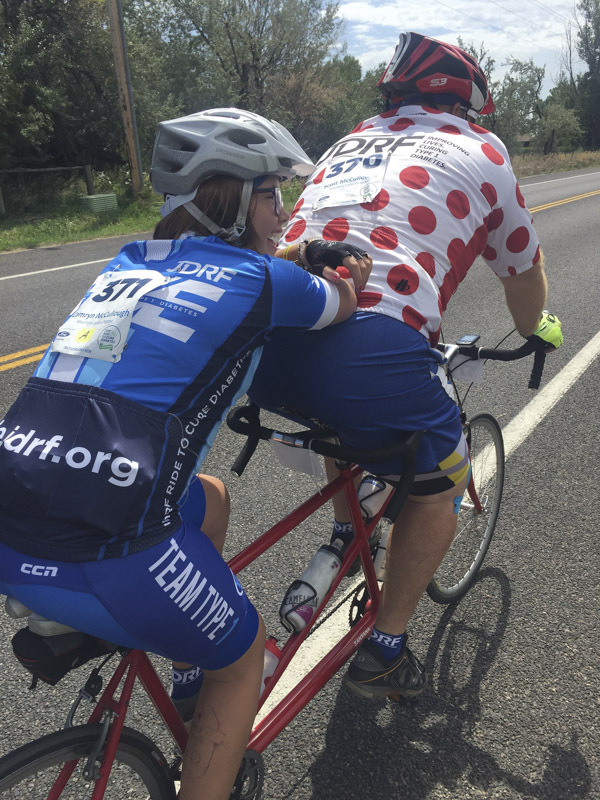 Among the people at the heart of JDRF rides, I count Ian Joyce as one of my favorites. I first spotted him in Death Valley behind his camera capturing moments, smiles, and gritty cycling efforts. After passing by several times, I stopped to introduce myself and inquire about his camera which was similar to mine. After about 5 words, I pegged Ian as a fellow introvert. We geeked out about lenses and cameras, and we’ve been friends ever since. I appreciate Ian’s introspection, wisdom, calm, peaceful energy, dry sense of humor, and dogged passion for finding a cure for T1D. I consider myself fortunate to have had the opportunity to see Ian in person again in 2012 at the LaCrosse, Wisconsin, ride and in 2016 at the Amelia Island ride. 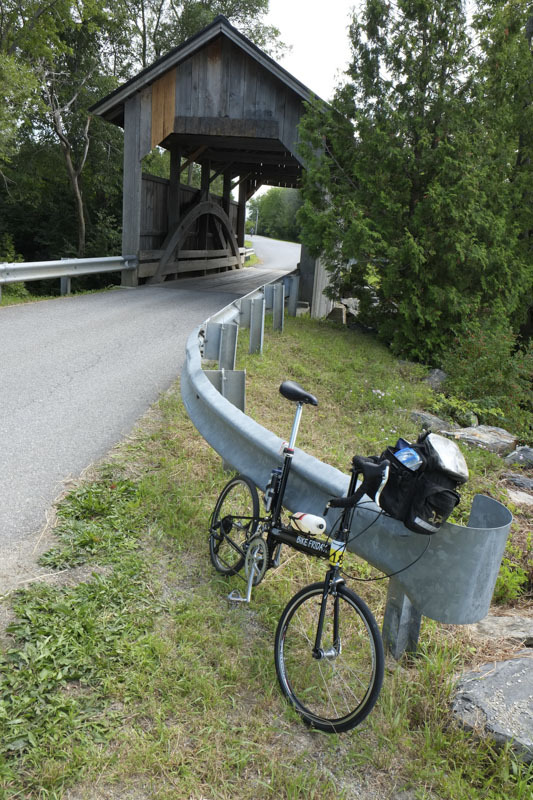 Several months after Amelia Island, Ian had a bike crash and then another. (These weren’t his first crashes that resulted in injury.) After chatting one day I asked if he’d be open to writing a guest blog about injury and T1D. This was my July: Recovering from a bicycle accident that left me with a broken clavicle and rib. Suddenly, I couldn’t ride my bike, and couldn’t run or engage in any of my other normal activities. A long, unhappy summer stretched out in front of me. My recovery had one additional component: Type one diabetes, or T1D . I was diagnosed 42 years ago, and though I’m active, healthy, and free of complications, T1D casts a shadow over the recovery process. The injured athlete with type 1 diabetes faces distinct physical, emotional and spiritual challenges related to our disease. Understanding those challenges and learning how to adapt to them are essential to not only becoming whole, but maintaining health during injury recovery. Type one diabetes is a numbers game. Good health demands monitoring blood glucose (BG) numbers and the quarterly A1c, which provides insight into average BG numbers for the past three months. Regular exercise is a critical part of maintaining stable BG numbers within a target range . Athletes with T1D who are regularly active have a higher, more consistent sensitivity to insulin. This consistency removes some of the unpredictability about T1D from decisions about how to manage insulin, nutrition and activity. Eliminating exercise triggers a series of cascading problems. Insulin sensitivity decreases; more insulin is needed to have the same affect. This can throw BG management off until the athlete recalibrates their bolus and basal doses to adapt to a lack of activity . Athletes have to immediately adapt to this change in sensitivity following an injury. Whenever possible, they should look for opportunities to build mild activity into their recovery plans. Even a twenty-minute walk following dinner can have a profound impact on increasing and stabilizing insulin sensitivity as well as managing swings in BG. And, transitioning back to a normal training routine will be easier to manage if the athlete takes steps to stabilize insulin sensitivity. Apart from keeping BG in range, athletes with T1D need to be conscious of other physical complications. In the case of my clavicle injury, keeping my arm in a sling placed me at risk for adhesive capsulitis, or frozen shoulder, a common complication from T1D. My recovery plan included progressive stretching as soon as I was able, to maintain my range of motion. The emotional side of T1D is less understood than the physical side, but it’s coming into clearer view for those who study the disease. Athletes can see training and competition as essential to their health and well being. Take those things away, and depression and stress may take their place. Both have a powerful impact on athletes as they navigate the recovery process. They also have a physiological effect on athletes with T1D. Stress triggers the release of counter regulatory hormones that increase blood glucose. These episodes can be intermittent or ongoing. Either way, they can lead to a roller coaster of high and low BG, complicating management. How we manage the emotional side of T1D is as individual as the athlete. For me, focusing on interests that had been sacrificed to time on the bike and reconnecting with friends were two tactics that helped me manage stress while I recovered this past summer. More than distracting me, those activities felt productive and fulfilling. Time in recovery gave me time to think creatively about new projects. Difficult as it was, when I realized that I would spend at least six weeks not cycling, I embraced the opportunity to do deep work that I had been putting off, and appreciated the value of having uninterrupted time to think and plan. Like everyone who goes through recovery from an injury, I had my tough days. The best antidote for those was to rest on the couch with my dogs and read a good book. T1D is a chronic disease, and there can be a dark outlook associated with it. Those of us with the disease are aware of the possibility of possibly fatal complications, diabetic ketoacidosis , and life threatening hypoglycemia . Injury can cause an athlete with T1D to suddenly confront, in a tangible way, evidence of their fragility and mortality. It becomes an existential crisis that threatens our identity as athletes and shakes faith in our ability to manage the disease. That’s the spiritual side of recovery. Athletes with T1D can respond in several ways, including: Meditation or other contemplative practices, turning to faith, or despair. July and August were an opportunity for me to press pause on a busy life and use my time to be intentional and ask big questions about my goals as a cyclist and how the sport fit into my life. Even when a powerful sense of fragility was staring me in the face, I could look at the answers from those big questions and see a path back to wholeness. I’ve read here that recovery is a team effort. That’s particularly true for those with T1D. Injury brings the importance of having a team into sharp relief. I’m fortunate to have a network of athlete friends with T1D who I can call on for support, health care providers who understand and encourage my cycling, and family and friends who stand behind me. Having that team, before I ever needed them to help me though my injury, made all the difference. 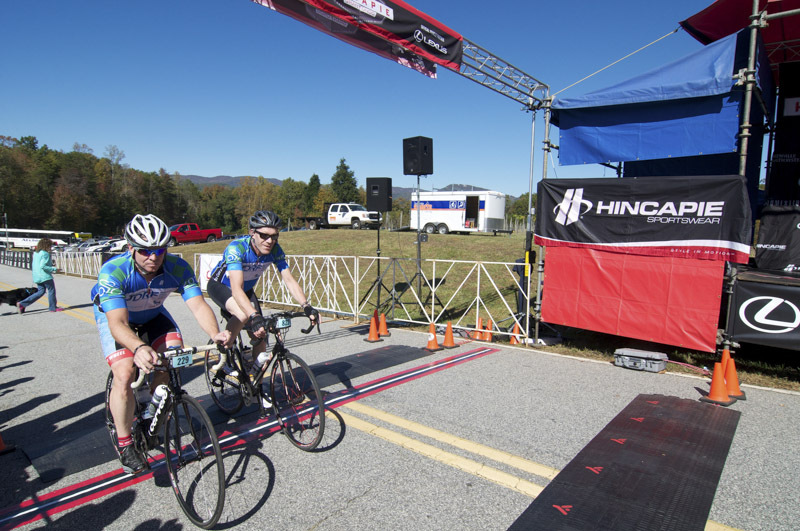 Ian Joyce is a USA Cycling certified coach who volunteers with the JDRF Ride to Cure program, where he teaches Performance in Exercise and Knowledge (PEAK), the first evidence-based guidelines for T1D athletes, to coaches and cyclists. He’s a writer, photographer, videographer and traveler who lives in Greensboro, North Carolina. Type one and type two diabetes are distinctly different diseases. For information about T1D read http://www.jdrf.org/about/fact-sheets/type-1-diabetes-facts/. A BG of 90-120 is a typical target, though this can vary depending on the individual and their activity. Basal insulin is either fast acting insulin administered in tiny doses via an insulin pump, or slow acting insulin injected once or twice a day. Bolus insulin is a single dose of fast acting insulin given to counteract food that is consumed. Diabetic ketoacidosis, or DKA, is a result of extreme uncontrolled high blood glucose. Hypoglycemia is low blood glucose.